ODG, aka Osterhout Design Group, already has a range of smartglasses on the market, but it's now looking to something quite different: an AR oxygen mask. 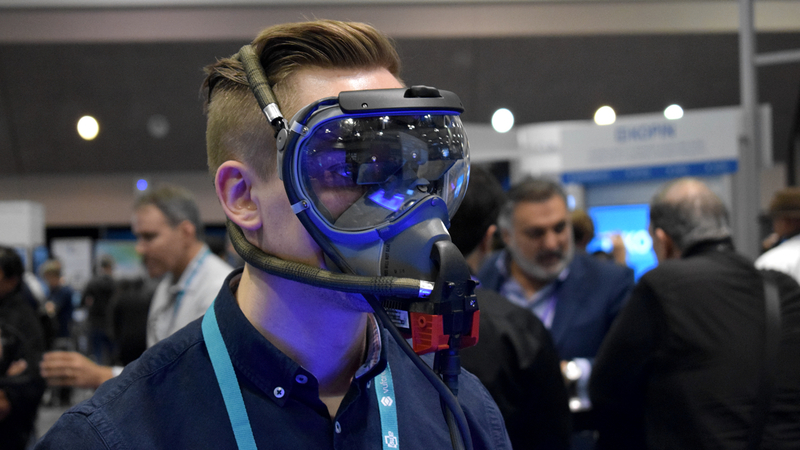 At the 2018 Augmented World Expo, ODG was on the show floor to demonstrate a working model of the mask, which it's named SAVED - for Smoke Assured Vision Enhanced Display - and has designed for commercial airline pilots. But why? According to Nate Klatt, ODG's senior director, about eight times a month, an aircraft cockpit will become filled with smoke. This obviously makes it difficult for pilots to see, and will lead to an emergency landing if the smoke cannot be quickly evacuated. FedEx approached ODG to make a wearable that would allow pilots to make a safe landing should such a situation arise - and this mask is the fruit of that labor. While it looks like a standard oxygen mask, inside there's a heads-up display showing a view from the nose of the plane. I was able to try it on and see a video depicting what that feed would look like in an emergency situation. I was able to clearly see a night-vision view of an approaching runway, though thankfully I wasn't asked to do my best Maverick impersonation. Klatt said getting the mask through FAA regulation has proven tricky, given that this is unchartered territory for AR. But Klatt said that they're almost through the process, and that SAVED should be a fully-fledged, usable AR mask very soon. And although it's been designed for FedEx use first, ODG plans to bring its technology to civil and commercial aircraft manufacturers and the military in the near future.